These simple little items really epitomize what jewellery is all about (except for the high cost). They sparkle, they twinkle, they flatter and they grab your attention like a punch in the nose. 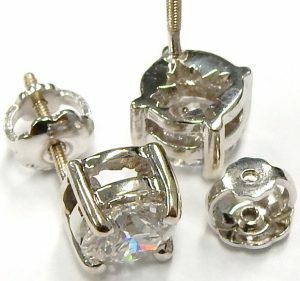 Each faceted drop shaped ball measures about 15mm in length without the connecting rings. The earrings are suspended by easy to use European backs that allow the drops to swing and sparkle with the slightest movement. The 18 inch box link necklace is strong and easy to use thanks to the sturdy lobster clasp. Manufactured completely from 14 karat white gold the set has a finished weight of 3.8 grams. They are in perfect condition, showing not even the slightest dent or ding. The factory applied bright white rhodium plating is completely intact. Really, who doesn’t love a disco ball. You can have 3 personal sparkling disco balls for the estate price of only $280.00 CAD. Stock #e12057. For those of you who were not blessed with the gift of living through the 80’s you won’t understand the decades obsession with sapphire and diamond clusters. 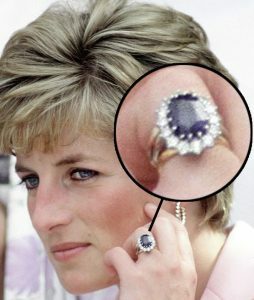 For an abbreviated explanation have a look at Lady Diana’s 1981 sapphire and diamond engagement ring. As soon as that ring hit newspapers and magazines, copies were popping everywhere from Tiffany & Co. to the Sears catalog. The original ring morphed into interpretations as varied as this pear shaped cluster pendant and earring set. The matched trio are of the deeper blue variety and combine for a total weight of approximately 1.18 carats. Each is surrounded by two tiers of I1-I quality round single cut diamonds that equal 1.00 carat total weight. The stones are all set into bright white gold and accented in warm 14 karat yellow. The pendant is suspended from a sturdy 16 inch long box chain. The earrings are equipped with extra heavy white gold friction backs for superior security. If you’re looking to channel a Royal other than Meghan or Kate get retro with this vintage Diana set for $1,260.00 CAD. Stock #e11994. Every once in a while we’ll receive something never been worn before that comes through our estate department. 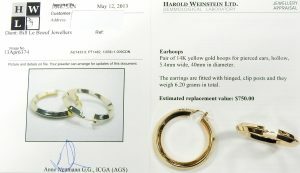 These 18 karat yellow and white gold hoop earrings were recently traded in for something the previous owner preferred. They are in absolutely perfect condition, not a scuff of scratch to be seen anywhere. 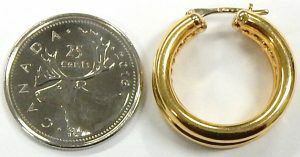 The smaller yellow gold set measure 35mm diameter, 2mm wide and weigh 1.8 grams. 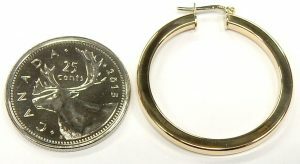 The larger 45mm pair weigh 3.9 grams and measure 2.8mm wide. Made from premium quality 18 karat gold using solderless posts they should be safe for even the most sensitive ears. Estate earrings are customer favorites so don’t expect these to be on display too long. Estate priced at $140.00 and $315.00. Stock #e11669. White gold sold. Yellow available. At 29mm x 24mm and 6mm wide these earrings are large but not so large that they can’t be worn all the time. Hollow construction allows them to be a manageable 3.4 grams in total weight. Perfect like new condition. The 14 karat wire hinged posts have no solder joints that could contact sensitive ears causing irritation. 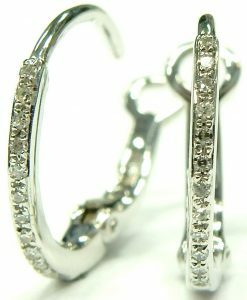 Hoop earrings at great prices are always some of our most popular estate offerings. These earrings were just polished and look like they just came out of the factory. Estate priced at $224.00 CAD. Stock #e11658. Being so petite these unique diamond drops are perfect for daily wear. Despite their size they make a powerful and luxurious statement with their impressive ingredients. Rarely encountered tear drop briolette diamonds each weigh an estimated 0.50 carat. In our 60 year history we have have never had a single example of this unique faceted bead style cut before. The custom cut drops, swing freely reflecting and refracting light like vibrant prisms. They are suspended from delicate floral clusters like no others with 0.24 carats of high quality VS-GH diamond petals plus 0.10 carats of natural colour fancy vivid yellow diamond centers. The earrings each weigh 1 gram and are made from premium quality platinum. They’ve been equipped with threaded posts and backs, which with regular tightening are a very secure closure. We’re confident you’ll never see a pair like this again. Estate price $3,920.00 CAD. Stock #e11245. The most robust invisible set studs you’ll encounter, and we can say that because we made them! The pair were meant to replace an older pair purchased from our estate department that were then unfortunately lost. As is the case with any custom piece that contains invisible set diamonds each of the 50 square brilliant cut diamonds were custom cut. A mandatory step that has the added benefit of ensuring the diamonds are perfectly matched SI2-H quality for seamless brilliance. Measuring 10.85mm x 10.85mm with strong protective 14 karat yellow gold edges and sturdy supportive undergallery. The 4.3 gram studs are equipped with threaded posts and backs for added security. Estate price $2,030.00 CAD. Stock #e10498. There’s nothing our service team likes more than when a piece of estate jewellery comes in that requires no work before going on the sales floor. Just a thorough high temperature ultrasonic cleaning and it’s ready to go. 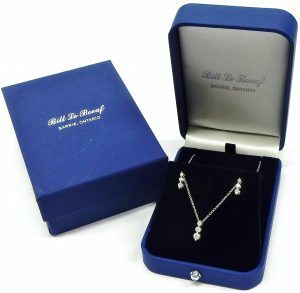 That goes double with this necklace and earring set that came to us in perfect condition showing no evidence of use. Even the original bright rhodium finish was 100% intact. Each piece contains three well cut, bright, graduated round brilliant diamonds of conservatively graded I1-I2-I quality, weighing an estimated 0.50 carat total weight. The diamonds are set in single shared claw settings leaving a maximum amount of uncovered diamond to sparkle without interruption. The trio is well made from 2.9 grams of 14 karat white gold. They come complete with tight friction backs and a 16 inch long delicate cable link chain. Packaged up with complimentary gift wrapping in our traditional blue and white satin gift box. The set is estate priced at only 543.00 CAD. $60.00 per diamond including the gold never looked to good. You just can’t beat the value of our estate jewellery. Stock #e11085. Yellow or white? 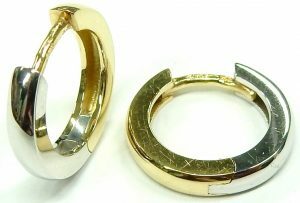 The choice is yours with these reversible two tone Huggie style earrings. 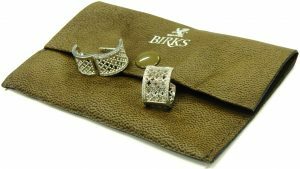 Made in Italy for Birks jewellers using premium quality 18 gold. The hinges are super tight showing zero wear. A while you wait quick polish to the yellow gold sections will have them looking practically new. To make them perfect would simply require a light polish to both yellow and white sections followed by a fresh bright white rhodium electroplating. This process would cost about $50.00 and take around a week to complete. The Huggie style has been a customer favorite for many years. The small hoop design can be worn 24/7 even while sleeping. Its smooth integrated design keeps the post completely concealed with the hoop. 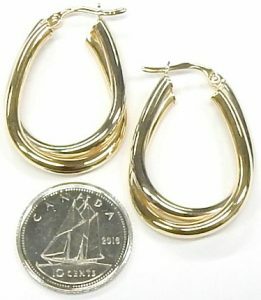 Although Birks are not currently showing this pair of earrings on their website, a basic hoop (slightly lighter in weight) is shown for $795.00 CAD. 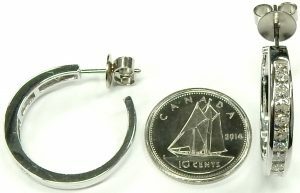 This 14.5mm set is estate priced at $420.00 CAD. Stock #e11505. At first glance the trio of diamonds that adorn this earring and pendant set look as if they are just resting on the rim of each circle. They couldn’t be more securely set however, with heavy under galleries wrapping protectively around the pavilion of each. The trio are all of bright I1-HI quality and all of Canadian origins, proudly laser inscribed as proof. The center diamond in the 9.2mm pendant weighs an estimated 0.50 carat and each 6.9mm stud is set with a 0.20 carat. The 14 karat set is in like new condition with all chromy white rhodium intact. The modern and sleek slider pendant is strung from a 20 inch long petite curb link chain with easy to fasten lobster clasp. Each stud is equipped with sturdy friction backs. Estate price for the set only is $1,680.00 CAD. Stock #e11898. Casual or dressy, this set has you covered. Thick bezel settings enhance the apparent size of these diamonds making them look far larger than the estimated total weight of 0.69 carats. The set has been well made from over 4.3 grams of 14 karat yellow gold. Reflective white rhodium plating encircles the diamonds further enhancing their appearance. Each diamond is a bright and lively well matched brilliant cut of I1 clarity with an estimated KL colour. Snug fitting friction butterfly backs secure the earrings in place. An 18 inch curb link chain slides through the large hinged bail adding an extra element of movement to the simple setting. If you’d like a longer or shorter chain we have many in stock that will have the pendant positioned exactly where you’d like it. 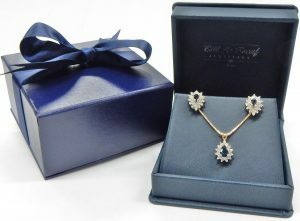 Comes complete gift wrapped in our traditional dark blue presentation box. Like new condition and estate priced at only $910.00 CAD. Stock #e11483. As with almost everything in life it’s all about the details. The ubiquitous gold hoop earring is a jewellery wardrobe essential. Details in quality make the deference between a pair that gets lost or quickly damaged and a pair that you keep forever. You can pick them up in super light 10 karat versions with light flimsy attachments to something like these that were built with quality and longevity in mind. You wouldn’t want something like this made solid as the weight would soon become unbearable. You also wouldn’t want them made so light that they easily dent. 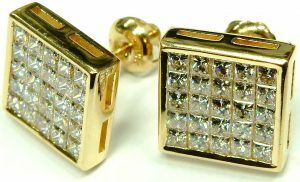 This pair weight a moderate 3.45 grams in 14 karat yellow gold and are made from seamless square section tubing for extra strength. The ear wires and corresponding hardware are made from 14 karat white gold. The white gold sections are not there for colour contrast but for added durability. White gold costs a bit more but it is a little harder and has better spring characteristics. The hinged wire has been properly riveted in place, not just pinched closed. Each of these earrings are assembled from 5 different pieces. While these details add cost they also add value. You’re less likely to loose one or damage them. You’ll never regret buying quality. This pair is estate priced at $280.00 CAD. Stock #e11159. Floral clusters are most effective at a distance making them the perfect candidate for earrings. During wear the six individual diamonds in each look like one much larger diamond. Being set at different angles the cluster makes a busier show of brilliance than its larger counterpart would. The 0.90 carats of round brilliant cut diamonds are of earring appropriate I2-I quality. 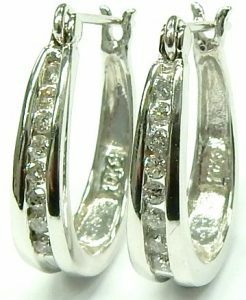 The 14 karat white gold earrings are themselves quite sturdy, weighing 3.8 grams. Each is equipped with strong posts and very heavy upgraded 6mm friction backs, making them more than appropriate for constant wear. Estate price $770.00 CAD. Stock #e11912. Montreal based designer goldsmith Thomas Alt’s German heritage is certainly apparent in these hand made earrings. The custom cut onyx that decorate each section are the epitome of Idar-Oberstein design of the 1980s. Their mix of matte and high polished faces with step cut geometry allow these unique stones to be surprisingly on point with today’s fashion. Especially the yellow gold hexagon tops with their low profile and earlobe covering 11.6mm width. 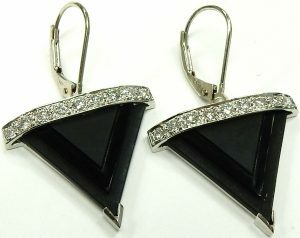 Being that we have such a soft spot for 80s fashion we couldn’t bring ourselves to fully modernize the earrings. The 14 karat yellow gold studs are in their original non-pierced form and we’ve added french backs to the 14 karat white gold drops. Those trendy triangles measure 18.4mm long and 20.1mm wide. The triangles are topped with 18 hand set round brilliant cut diamonds of a very nice VS-GH quality. The 0.36 carats are a very good to excellent cut grade. They throw a ton of sparkle and contrast to the mostly matte finish of the black onyx. If you too are an 80s enthusiast we can quickly convert them back to a two tone dangling pair. If however you don’t appreciate retro glam than you can take them as is with a two-for-the-price-of-one value. 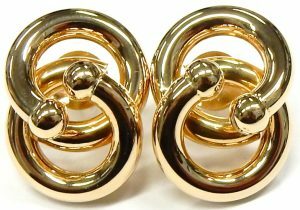 For an additional $150.oo including heavyweight friction backs either pair can be converted to conventional studs; upping the modern motif by raising the earrings to the center of the earlobe. The pair in their original form are accompanied by a 1992 Certificate of Appraisal with a Retail value listed at $2,050.00 CAD. Our estate price for the two pair are $1,190.00 CAD. Stock #e11338. The price of diamonds is like pretty much everything else bought or sold; they’re ultimately tied to the value of the U.S. dollar. It doesn’t matter that these diamonds were mined in Canada, they are priced in United States Dollars then adjusted to reflect the value compared to the Canadian dollar. What is interesting about this pair is that they were purchased in December of 2010 when the USD/CAD relationship was the same. How things have changed; today the American dollar is worth well over 30% more than a Canadian dollar. In theory these earrings are worth at least 30% more today compared to 2010 assuming zero inflation and zero price increase in diamond prices over the last 8 years. Both of these diamonds are a perfectly matched 0.53 carat, both with a SI1 clarity, F colour and an ideal cut. 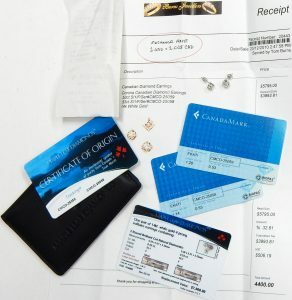 The beautiful set came accompanied by Gem Scan appraisal card, Ekati diamond mine origin certificate along with the original purchase invoice. 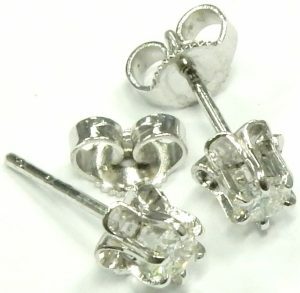 The diamonds are secured by 14 karat white gold double gallery settings with threaded posts and screw back butterflies. 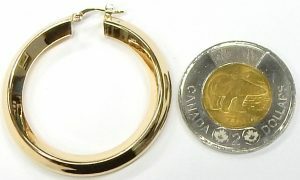 Even the gold used in the construction of the earrings was Canadian sourced. The bottom gallery of the setting has been pierced with the outline of a maple leaf. Perfect condition, high quality and 100% Canadian make a great combination; estate priced at just $4,270.00 means they are also a great value. Stock #e11903. Thomas Alt was a Montreal based jeweller from a long line of German goldsmiths. Both of his parents were raised in Idar-Oberstien, once the world center for gem trade, the cradle of Art Deco design, and the modern home to many master stone cutters. His family’s roots in the jewellery trade date back 200 years. You can tell from his expressive and confident work that he was raised into this trade. Our limited edition Thomas Alt screw back earrings measure a statement making 19.6mm diameter. The high dome 14 karat yellow gold bases have been decorated with subtly white gold wire work. The gestural framework creates an artistic nest around the asymmetrical diamond focal points. Both diamonds are of a high VS1 clarity, I colour and together weigh an estimated 0.57 carats. The diamonds throw an eye-catching spray of spectral colour and bright white flashes. The 11.79 gram pair are accompanied by a Thomas Alt signed certificate stating their limited edition along with a 27 year old Certificate of Appraisal stating a retail value of $3,300.00 CAD. Our estate price $2,800.00 CAD. 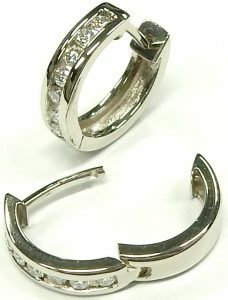 For an additional $150.00 the pair can be converted to pierced studs with heavyweight friction backs. Stock #e11335. These well-made earrings are an excellent example of the upside to working with silver. Being a relatively inexpensive material jewellery items can be made more substantial and long lasting without raising prices to subsidize the added cost of making items that last. With thick posts, heavy earring backs, and strong connection rings these earrings will easily survive a life time of wear. Each earring contains 27 deep set round brilliant cut crystals and two pieces of natural tigers eye with beautiful natural golden brown graining. If you like a good sized earring these will do the trick at 2 inches in length. Thomas Sabo has become a big name in sterling silver fashion jewellery and for good reason if these earrings are an example of the general quality of the brand. Steffans of Northampton had a similar pair listed on their website on sale 1/2 price for 74.50 pounds sterling item number H14553-1-759. Our estate price of $140.00 CAD makes these the perfect entry point into this high end fashion brand. Stock #e9631. A little more sophisticated than the typical basic stud we regularly offer. Each of the main diamonds weighs an estimated 0.35 carats of excellent VS2/SI1-EF quality. A further 10 round brilliant cut diamonds of VS/SI-F quality decorate the gentle “S” shaped bottom sections. The earrings weigh 3.0 grams, measure 16mm long and are secured by snug fitting upgraded 2 piece butterfly friction backs on posts. 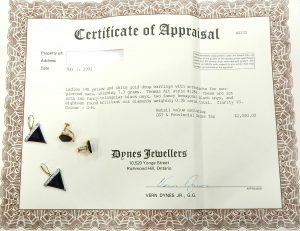 Included with the pair is an April 2013 appraisal by respected Toronto jewellery appraisal service Harold Weinstein Ltd. Estate priced at $2,870.00 CAD. Stock #e7946. Few gemstones exhibit the type of colour saturation like a fine amethyst does. This most regal hue of purple is one of the jewellery world’s greatest bargains. Fine amethyst of this size can be found for as little as $40.00 per carat! A purple sapphire of similar colour will run you over $3000.00 per carat. Even a really nice tanzanite is going to cost around $1000.00 per carat. 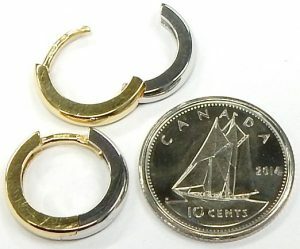 These are good sized earrings measuring 15.0mm x 12.5mm. 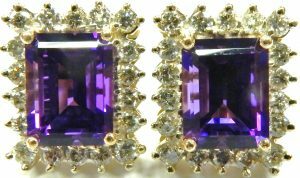 The high quality emerald cut amethysts are surrounded by 36 small round brilliant cut diamonds of SI-KL quality. Together the diamonds contribute 0.90 carats of sparkling diamond weight. Constructed from over 6 grams of yellow and white gold and secured by brand new snug fitting upgraded 6mm friction backs. Estate priced at $1,050.00 CAD. Stock #e10849. 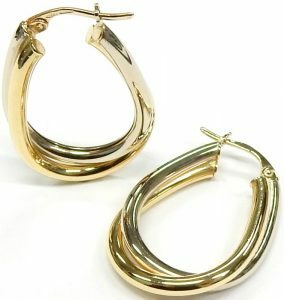 With the 80’s and 90’s coming back into fashion over sized yellow gold hoops are back and back in a big way! 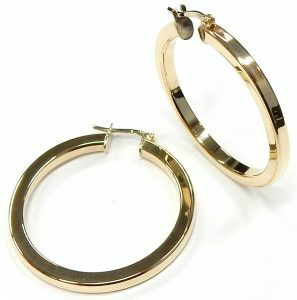 Whether your channeling Madonna or J-Lo these 40mm in diameter hoops are just the thing. The angular diamond cross section creates a fun house mirror affect on the high polished faces of each hoop; playing with light and reflecting the world around them. 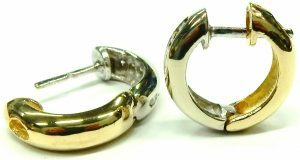 Made from a substantial 6.2 grams of 14 karat yellow gold the earrings are in great condition, secured with standard hinged posts. 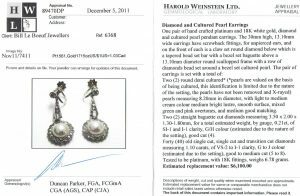 They are accompanied by a Harold Weinstein Ltd. Jewellery Appraisal listing an estimated replacement value of $750.00 way back in 2013 when gold was priced at just $1,433.00 per ounce Canadian. 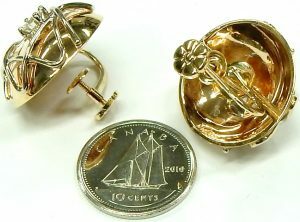 Even though the price of gold has increased to well over $1,700.00 our estate price for the pair is just $546.00 CAD. Stock #e11869. A stunning pair of Effy drop earrings that are guaranteed to turn heads at any holiday party! Playing with the rich tones of topaz the earrings pair London blue studs with intense Swiss blue drops that flash an icy brilliance during wear. Those 11.9mm x 8.2mm drops are inventively set under diamond encrusted ribbons of brightly rhodium plated 14 karat white gold. Together the diamonds equal an approximate weight of 0.10 carats with a combined topaz weight of about 9 carats. The earrings each measure 20.65mm long and come equipped with strong posts and heavy friction backs. Perfect condition and looking truly unworn. Estate price $665.00 CAD. Stock #e11636. The timeless diamond solitaire stud with that modern twist you’d expect from Roberto Coin. Set into softly rounded, brightly rhodium plated 18 karat white gold bezels the SI2-I1-H round brilliant cut diamonds end up looking much larger than their 0.90 carat total weight suggests. The diamonds are of a nicer quality than their grade suggests, showing no inclusions visible with the naked eye. In matching miniature bezel settings behind each diamond is one natural ruby, Roberto Coin’s signature on all his jewellery. The unique, brightly shining set comes equipped with heavy friction backs and original Roberto Coin box. Estate price $3,430.00 CAD. Stock #e9870. If you’re looking at diamond studs this year as many people are, make sure you consider the most important of the 4 Cs, the cut. Did you know the cut can affect the price of two otherwise identical diamonds by 40%. Funny how almost no one mentions the quality of cut when advertising diamond studs. We just had both of these diamonds re-manufactured to excellent cut. They were both very nice SI2 clarity (one almost an SI1), they had identical H colour and they exhibited the same level of medium blue fluorescence. We thought, lets improve their average to good cut and make an exceptionally well matched set. Have a look at the geometry on the cut reports to see just how well they now compare. All the critical dimensions and angles are virtually the same. We lost 10% of the original weight but these diamonds sparkle so much better now. Many people who sell jewellery can’t understand why we would take 2 perfectly acceptable diamonds, have them re-cut to a smaller size by having them re-proportioned and spend hundreds of dollars doing it. The reason is simple once you see them in person, they are waaaaaaaay more brilliant and dispersive. They are also more valuable once the superior cut is taken into consideration. There is no sense having a set of diamonds with a nice clairty, colour and carat weight if they aren’t well cut. That’s too bad because every diamond has the potential to be cut to a high standard but many manufacturers choose to conserve finished weight for the psychological advantage of a heavy diamond that still looks good compared to an excellent cut diamond that explodes with brilliance. We’ve set this beautiful set into our most popular 14 karat white gold double gallery settings. The upgraded 6mm butterfly backs are much heavier and more secure than what you’ve been accustomed to seeing. I guess we could have sold them new inventory but we’d rather sell them with the rest of our estate jewellery as re-manufactured vintage diamonds. They are estate priced at $4,270.00 CAD. Stock #e11833. Casual or dressy, this set has you covered. Thick bezel settings enhance the apparent size of these diamonds making them look far larger than the estimated total weight of 0.70 carats. The set has been well made from over 5 grams of 14 karat yellow gold. A reflective white rhodium plating circles the diamonds further enhancing their appearance. Each diamond is a bright and lively well matched brilliant cut of solid I1 clarity with an I colour. The earrings have been upgraded with threaded posts and backs for added security. An 18 inch cable link chain slides through a hidden bail on the pendant that keep the focus on the simple setting. If you’d like a longer or shorter chain we have many in stock to have the pendant positioned exactly where you’d like it. 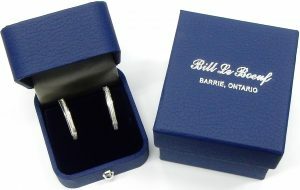 Comes complete gift wrapped in our traditional blue and white satin presentation box. Like new condition and estate priced at $1,050.00 CAD. Stock #e10968. There’s nothing our repair staff like more than a piece of estate jewellery that requires no work before going out to the sales floor. 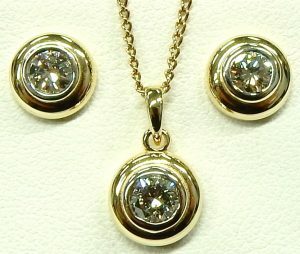 That goes double with for this necklace and earring set that came to us in perfect condition showing no evidence of use. Even the original bright rhodium finish was 100% intact. Each piece contains three well cut, bright, graduated round brilliant diamonds of I1-I quality weighing an estimated 1.00 carat total weight. The diamonds are bezel set at three levels so their girdles overlap, leaving no empty space to break up the sparkle. The trio is well made from 3.6 grams of 14 karat white gold. They come complete with tight friction backs and a 16 inch long delicate curb link chain. Packaged up with complimentary gift wrapping the set is estate priced at $1,190.00 CAD. Stock #e9694. EFFY’s Classique line plays on the contrasting optical effects of baguette cut diamonds and round brilliant cut diamonds for a modern, iced all over appearance. The D’Oro earrings are a fun take on the traditional diamond drop stud with their bottoms swooping in accenting the jaw line during wear. 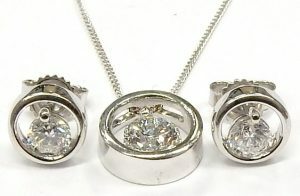 Together the pair carry 1.33 carats of I1-IJ diamonds set into 7.5 grams of brightly rhodium finished 14 karat white gold. The earrings are secured with strong omega backs for added security and are currently listed on Macy’s website for $1,630.00 (on sale from $5,703.00). 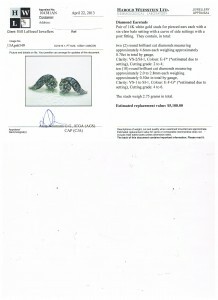 Our estate price for the like new pair $1,500.00 CAD. Stock #e9293. 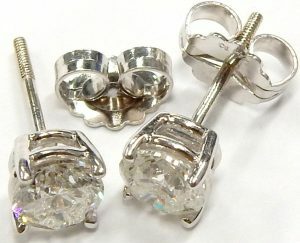 There is just no way we’d have the time to post every single estate item in stock, let alone just posting every pair of diamond studs that come in. 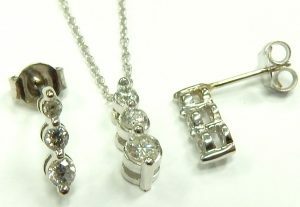 We have literally 1000s of loose and mounted diamonds in simple 4 prong settings like these. 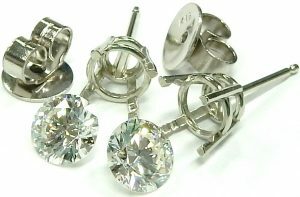 We have diamond studs for under $100.00 to into 5 figures. No matter what you’re looking for I’m sure we can accommodate your request for a price that lets you get more than you expected. This small pair would make a great set for someone who recently had their ears pierced or for the person with several piercings on their ears going for a graduated look. 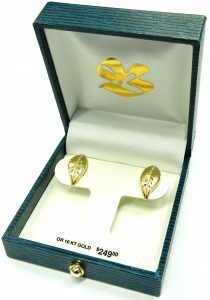 They are secured in a traditional 14 karat yellow gold crown style setting. The SI2-I1-KL quality grade keeps the price very reasonable while at the same time sparkling as a diamond should. For less than $65.00 each the value is easy to see. The pair is estate priced at just $129.50 CAD. Stock #e10442. The knowledge that these hoops are hollow may make some people worry about their quality, thinking them fragile and soon to be dented. That’s a fair mind set where many hollow hoops are concerned but not with this 8.3 gram pair. The 24mm diameter 14 karat yellow gold earrings, though made hollow, are much heavier than most and quite durable. 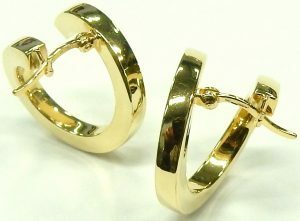 The earrings are equipped with strong posts and very heavy 18K yellow gold friction backs for extra security. Estate price $560.00 CAD. Stock #e9984. These Italian made hollow hoops boast an inventive cradle-like catch that hold each hoop high on the lobe, nearly disguising the catch entirely. 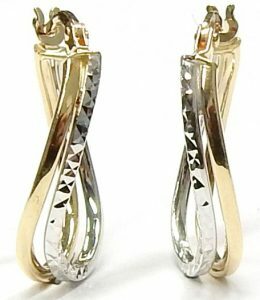 That cradle style catch plays to the elegant drooping nature of each high polished earring. The luxurious hue 18 karat yellow gold appears to drip like honey, pulled slowly by gravity. The 5.9 gram pair are in unworn condition and measure a statement making 24.7mm long by 10.0mm wide at their bottoms. Estate price $480.00 CAD. Stock #e10495. The Muse line is Birks’ homage to their roots with the intricate lattice pattern taken directly from the decorative grill work of the original St. James Street store in Old Montreal, opened in 1879. 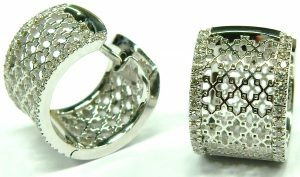 That delicate pattern is the perfect motif for this pair of 14.5mm long by 9.8mm wide huggie hoops. Transforming an every-day-wear piece of jewellery into a pair of head turning hoops versatile enough to dress up a pair of jeans or finish off a cocktail dress. 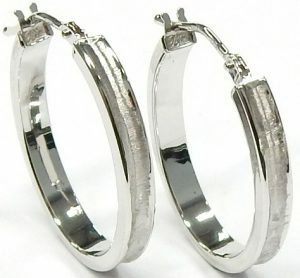 The top quality hoops are made from 6.9 grams of 18 karat white gold finished in bright chromy rhodium. The filigree pattern is bracketed by two rows of VS-FG round brilliant cut diamonds that come together for a total weight of 0.31 carats. The hoops are equipped with very strong, expertly integrated posts and hinges for added peace of mind. The pair are listed on Birks website for $3295.00 CAD. Our estate price for the brand new pair and their Birks travel pouch $1,977.00 CAD. Stock #e10480. This has got to be the most elegant “dog tag” style pendant we’ve ever had come through our estate department. We see them pretty often in silver and occasionally in 10 or 14 karat gold, but never have we had one made from rich premium 18 karat Italian gold. 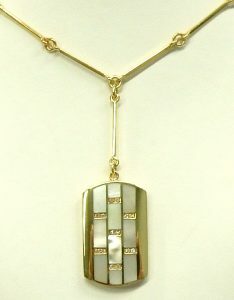 The pendant measures 30mm x 19mm, containing 10 iridescent hand cut mother of pearl inlaid sections along with 14 bead set single cut diamonds of high VS-GH quality. The pendant is integrated into an 18 inch flexible bar link necklace. Every joint and pivot point throughout the necklace look like new showing no wear of any kind. Accompanying the necklace is a pair of matching clip on earrings. 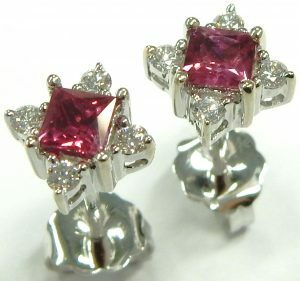 The earrings are equipped with strong spring loaded backs. 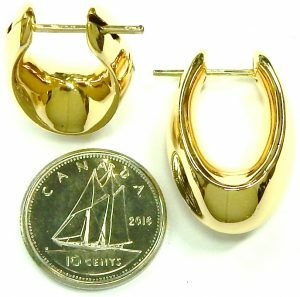 If you have pierced ears we can easily convert them using the original hinged spring backs and welding on new 18 karat gold posts. Much thought has been given to the design and manufacture of this set. The earring backs have used 18 karat white gold to form the friction sections because of its superior spring quality compared to yellow gold. This set was made as exercise in high quality design as nice as any jewellery available. Between the earrings and pendant there are 50 small single cut diamonds that total an estimated 0.33 carats. The earrings and pendant weigh close to 1 full troy ounce at 28.6 grams. They are being sold as a set only for the estate price of $3,150.00 CAD. Stock #e10772. Hoops or studs, this pair of diamond earrings combines the best of both. With a 22mm diameter they are a little large for continuous wear unlike hinged huggie styles meant for comfort during sleeping. The stud posts with extra strong friction backs are an equally if not more secure alternative to hinged hoops. As the hoop backs serve only a decorative function they taper gracefully to keep the focus on the diamond encrusted fronts. A perfect 1.00 carat of combined and extremely well matched I1-J princess cuts are set girdle to girdle in protective channels. 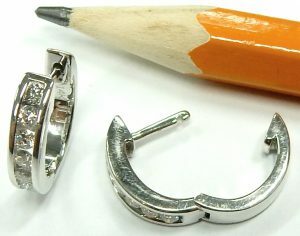 In almost unworn condition the 5.9 gram pair retain their original rhodium plating on top of their 14 karat white gold. 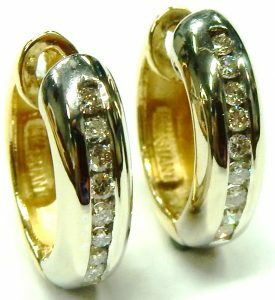 This pair of earrings at one time were a matching set of diamond anniversary rings. Our clever and ingenious onsite gold smiths thought it would be a fun exercise to convert them into a killer pair of earrings. I guarantee you’ll never find a better built pair of earrings than these. The solid construction makes them practically impervious to damage. Estate price $1295.00 CAD. Stock #e11544. I don’t think there is another country with jewellery so deeply ingrained in its culture as India. Their jewellers have been developing their craft for almost 5000 years, passing knowledge down through the family lines. 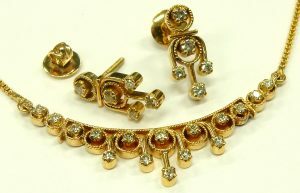 Because they pass from generation to generation certain styles, motifs, and techniques have developed in specific regions allowing a skilled eye to tell where a piece of jewellery comes from based on how it looks and how it was made. So it is no surprise that India is now one of the largest jewellery manufacturing countries in the world and the largest hub for diamond cutting and polishing. A lot of the focus of jewellery culture in India is to show status and affluence so brides are heavily gifted with elaborate pieces made from the finest materials. These gifts are also a way to give the young couple some contingency for their future as gold and diamonds will always carry value. That is how we happened on this intricate set, the young couple kept their favorite pieces and traded in those they didn’t need. Very well made from a total of 15.4 grams of18 karat and 22 karat gold, the set is a beautiful addition to our estate department. The millgrained necklace and earrings feature 1.00 carat total weight of SI-J round brilliant cut diamonds that stand out nicely against the warm yellow of the high quality gold. The necklace is 16 inches long but wears a little longer due to the curved pendant section. The earrings feature heavy hand made screw on backs for extra peace of mind. We’ve had other pieces of Indian jewellery in the past but these are by far the most universal thanks to their smaller size and exquisite motifs. 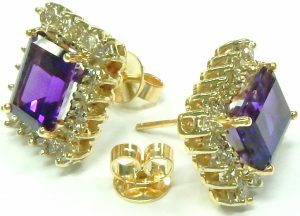 Being sold as a matched set only only for the estate price of $2,040.00 CAD. Stock #e9759. 100s of years experience has made Italy the undisputed leader when it comes to producing high quality jewellery. The finish and design are qualities few others can match. Specialties of the Italian jewellery industry are chain, bracelets and hollow constructed items. These earrings weigh a reasonable 7.2 grams making them comfortable to wear. Their hollow construction allows them to measure a generous 1 inch in length. If they were completely solid the weight would make them impossible to wear. The highly polished overlapping circles are discretely soldered in only two spots; this makes the seamless tubes to appear to be floating. It’s a very cool design and definitely a tricky thing to assemble. We’ve supplied brand new upgraded 6mm friction backs. 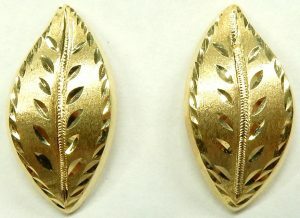 These high quality butterfly backs supply much more security for the earrings and help keep them from drooping forward. Brand new condition they’re completely scratch and scuff free. Estate priced at $455.00 CAD. Stock #e11723. 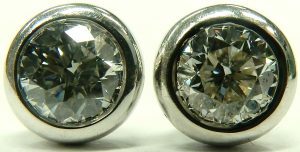 With diamond earrings like this, the metal colour is almost a non issue considering you can only see it when viewed from the side. The diamonds span 13.7mm on each hoop front, following the gentle curve to disappear behind the earlobe. The 14 round brilliant cut diamonds are a narrow ellipse for added elegant movement. Together they make a combined carat weight of 0.46 carats of bright and lively I1-I quality. Each 14 karat yellow gold hoop is equipped with a locking hinged back for added peace of mind during wear. Estate price for the unworn pair $560.00 CAD. Stock #e11897. 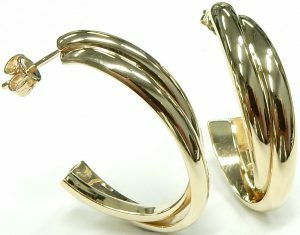 The fun and modern pig tail curl earrings are a playful take on hoops turned sideways. The pair come equipped with very secure lever style catches making them safe for daily wear. Measuring 19mm in diameter and weighing a comfortable 3.0 grams these 18 karat yellow gold earrings will make a unique addition to anyone’s collection. Estate price $294.00 CAD. Stock #e9658. If you want an example of brand power look no further than these Tiffany & Co. Elsa Peretti Diamonds by the Yard earrings. The petite studs measure 4.14mm in diameter and weigh in at only 0.94 grams. Each is set with one 0.07 carat round brilliant cut diamond of Tiffany’s typically high VS-FG quality. Well made and secured with strong friction backs the earrings are of undoubtedly higher-than-normal standards. Still they are sterling silver and if you approach them from a raw materials stand point there is $0.56 worth of silver here. 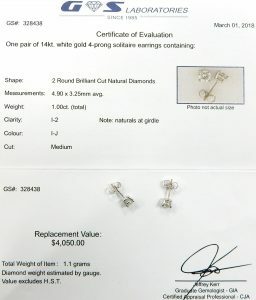 The diamonds, even with their excellent cut grade, could easily be purchased from a generic supplier for anywhere from $300.00 and up for the pair. Now jewellery is not valued for just the lowest cost of its components and raw material; just as that new car is not valued for only the steel it contains. Manufacturing costs and profit margins certainly need to be taken into consideration. Tiffany has done an amazing job marketing their brand and leveraging the value of the name to command top dollar for all of the amazing products they sell. 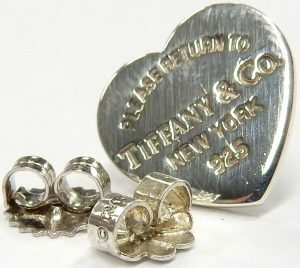 These earrings retail at Tiffany’s for $1,300.00 CAD. To account for this you have to layer three things onto these studs. First there’s Tiffany’s history, the tradition of utmost luxury, reputation and the value the blue pouch adds to anything it houses. Second they are Elsa Peretti, the 1970s model turned Tiffany designer has produced some of the institution’s most iconic lines. Third the earrings are Diamonds by the Yard, the forerunner of Tiffany’s exploration into the trend of layered jewellery. We’ve seen enough of T & C0. 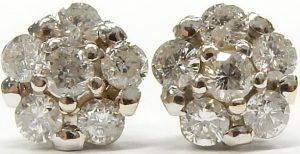 to know that these diamond studs should not last long. Tiffany is the brand that needs no justification. Estate price $650.00 CAD. Stock #e11905. A delicately tapered set of diamond hoop earrings is an elegant accent to any occasion. The well made pair bring a subtle touch of sparkle with their 0.16 carats of I2-IJ round brilliant cut diamonds. Made from 3.1 grams of 10 karat white gold which still retains its untouched chrome white rhodium finish as proof of their like new condition. The dropping ovals are fastened in place with sturdy locking posts. Estate price for the like new pair $245.00 CAD. Stock #e11443. 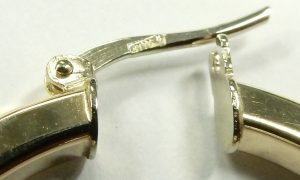 Bright cutting is a simple technique of engraving short angular lines in jewellery items using an extremely sharp tool. The resulting crisp details reflect light making the piece sparkle and twinkle like hundreds of tiny mirrors. 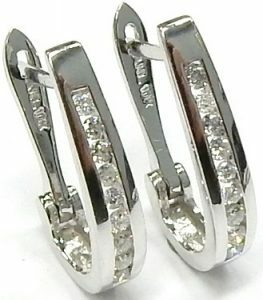 This pair of 18 karat white gold Italian made earrings measure 23mm x 19mm and weigh in at a substantial 4.7 grams. The bright cut finish has been applied around the entire circumference and edges resulting in a fantastic look from any direction. The strong hinged wire posts are secured by a proper rivet ensuring a long life of trouble free operation. 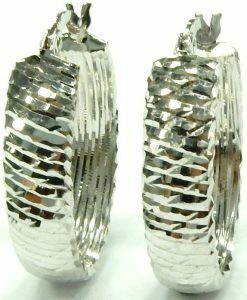 These earrings are in perfect condition still retaining the original factory rhodium plating. A side benefit of a bright cut texture is: should you accidentally incur a small dent or ding you’d never even notice it. 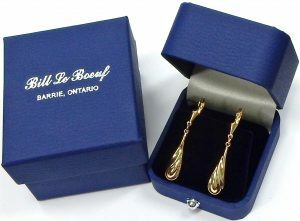 The earrings are estate priced at $483.00 CAD. Stock #e10801. 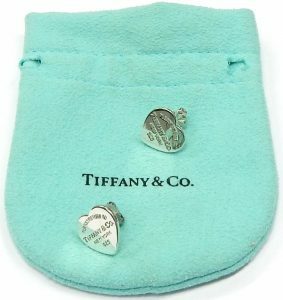 This retired pair of Return to Tiffany Heart Tag earrings are the big sister of the current Mini size available currently for $205. At 13mm wide these earrings are hardly large. They take up most ear lobes perfectly and flash a bright mirror finish at the slightest movement. Tiffany & Co. iconography at a glance for $108.00 CAD including Tiffany travel pouch. Stock #e11953. Spanning over 8mm wide with a diameter of 24mm these unique hoops are certainly statement pieces. 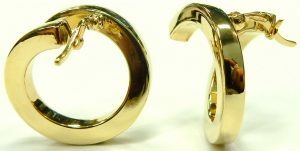 The extra warm tone of their top quality 18 karat yellow gold is head turning itself as most hollow hoops are made of lower quality 10 or 14 karat. Despite their impressive 10 gram bulk the hoops still manage to feel elegant and airy thanks to the delicate pierced windows around each decorative bead. The hoops are fastened with strong hinged posts and catches for added security. Usually if hoops come in with a dent they automatically go in with our precious metal recycling. The tiny dent on the backside of this one was so small and their quality was so high we didn’t have the heart to refine them simply for metal recovery. As such we’ve priced them extra aggressively considering they’d be well bought at $1,500.00. Included with purchase is a complimentary refinishing. A fresh polish will help soften the minuscule imperfection rendering it virtually invisible except under extreme scrutiny. The pair is estate priced at $675.00 CAD. Stock #e11873. These aren’t those shoulder brushing statement earrings that decorate runways and festival stages but they’ll certainly make a statement at the office or an evening out. The 31mm demi hoops lay gracefully across each other adding volume with their doubled up dome profiles. The 4.6 gram 14 karat yellow gold hollow hoops are equipped with sturdy posts and strong friction backs for added security during wear. Perfect condition, no dents or dings and freshly polished. Estate price $350.00 CAD. Stock #e11238. 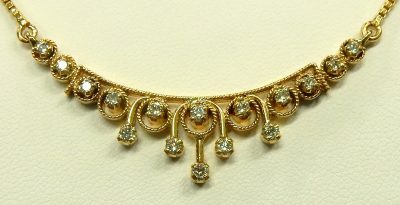 One of the great things about our estate jewellery is most of what we get we’ll never see again. One of the bad things about estate jewellery is most of what we get we’ll never see again. I’m sure we could sell 100 pairs of these funky earrings if we could only get more. Unfortunately these are the one and only pair we have. The hollow knife edged creations would be extremely difficult to manufacture. It’s no surprise they were made in Italy. Italian jewellery makers have no parallel when it comes to producing designs like these. Making something like this from round tubing would be challenging enough; try to do it with knife edge triangular tubing in two colours. Once you’ve accomplished that do it again exactly the same in its mirror image. As a finishing touch, all you need to do it solder solid end caps with hinged hardware without turning the whole thing into a puddle. Trust me, it’s an art making these that few can master. They measure 33mm x 20mm and can be worn with mostly a yellow side showing or the white depending your mood. Perfect condition and perfectly polished showing no dents of dings of any kind. Estate priced at only $329.00 CAD. Stock #e11780. 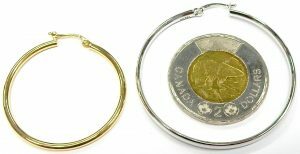 For way less than the cost of a good dinner out, you could surprise your lady with a small token of affection like these fun little hoop earrings. The bright cut rhodium finish twinkles like little diamonds. While only $77.00 don’t assume these are not made of quality stuff. 1.5 grams of sturdy 10 karat gold and properly riveted hinge backs clip snugly into the corresponding snaps. We only have one pair like this and they’re only $77.00 CAD. Stock #e11781. While we don’t spend much time showcasing smaller items like these great pair of earrings online, they still make up an important part of our inventory. 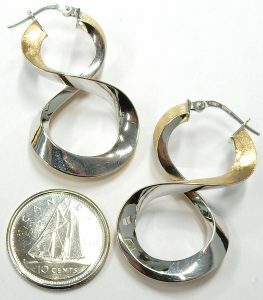 Perfect condition Italian made hollow hoop earrings measuring 23mm x 19mm. These will not linger around here very long. 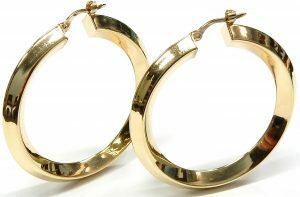 Every woman loves a pair of hoop earrings as a stocking stuffer. Beat the crowds and save your self the stress of last minute Christmas shopping. 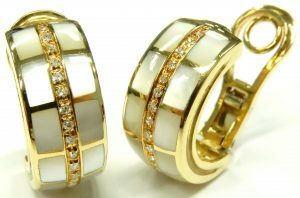 The bright white pair are priced at $84.00 and we’ll even gift wrap the Bill Le Boeuf Jewellers box for no charge while you wait. Estate priced at only $84.00 CAD. Stock #e11755. We’re jewellers not photographers. 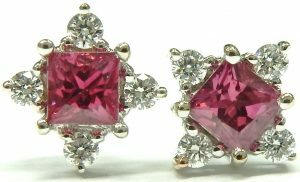 Although a bit washed out in pictures, the rubies that grace each of these studs are much more vibrant and crystal clear in person. At 0.25 carat each the princess cut pair are eye catching for their brilliance and intense colour. Each is accented with four very well cut, high quality round brilliant cut diamonds. Creating a kaleidoscope pattern of layered diamond shapes. 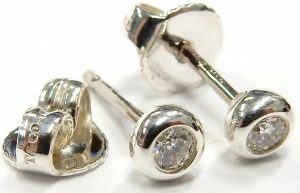 The 1.8 gram 14 karat white gold studs retain their original rhodium finish and each is equipped with strong posts and heavy friction backs. Estate price $560.00 CAD. Stock #e11542. 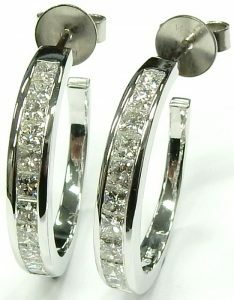 Another great pair of white gold hoop earrings; these are even better with a little bling. 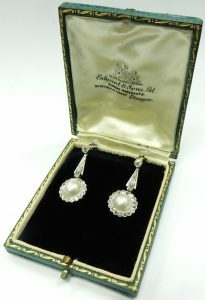 White gold estate earrings don’t come in nearly as often as we get requests for them. This pair is in excellent condition still displaying the bright white polished rhodium finish from the factory. The lever backs with locking trigger offer excellent security and are still very easy to put on and take off. I sure it took longer to get these little guys balanced for their picture than it’s going to take to tell you about them. They measure 17.5mm x 12.5mm and weigh 1.9 grams. Each earring contain 9 fully faceted round brilliant cut diamonds estimated to weight approximately 0.014 carat. They total a nice tidy 1/4 carat and are of nice I1-IJ quality. Popular style and great value means expect to see them marked SOLD really soon. Estate priced at just $252.00 (that’s only $14.00 per diamond and the gold is free). Ready to go. 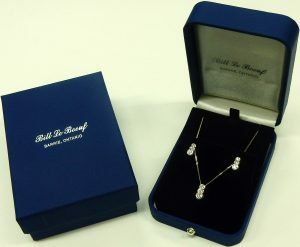 You’re going to get a giant smile when she opens Bill Le Boeuf Jewellers little blue and white box and sees what’s inside. Stock #e11754. Radiant cut diamonds are rarely encountered in pairs, so the two clarity grade difference between these two is not surprising. Side by side the difference between the I1 and SI1 is noticeable if your looking for it, during wear when the pair are separated by a pretty face the difference isn’t seen. Both 0.32 carat and 0.34 carat are a nice G colour and the former is Canadian in origin. 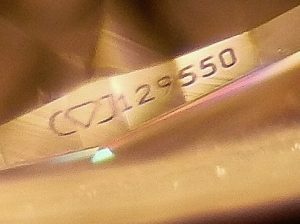 Originally from the Diavik mine the diamonds girdle is laser inscribed with a microscopic maple leaf and unique serial number. 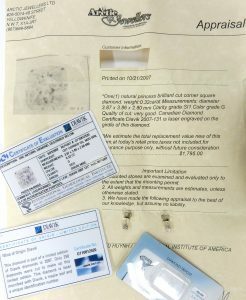 It is also accompanied by an IGI Certificate of Evaluation and an appraisal from Yellowknife’s Arctic Jewellers Ltd. The pair are set into brand new antique inspired 14 karat white gold studs with heavy friction backs for optimum security during wear. Estate price $893.00 CAD. Stock #e11271. I think the only way to properly describe these hoops is “cute”. Not only are they an earlobe hugging 12.5mm in diameter their fronts only span 1.15mm in width. All you can see during wear is a dainty line of diamonds, with each holding 12 surprisingly bright and lively I1-H round single cut diamonds. All together they only amount to 0.05 carats but man do they throw a lot of light. Made from 1.4 grams of brightly rhodium plated 14 karat white gold. Despite their size the hoops have been equipped with top quality hinged french backs that snap smartly into place around the curved posts. The adorable pair are in brand new condition and are listed for the petite estate price of $140.00. Stock #e11281. When was the last time you saw a matching pair of 100 year old GIA certified antique European cut diamond earrings? I’m thinking likely never! Finding a single good sized European cut diamond is an uncommon occurrence, finding a matched set almost never happens. This beautiful pair arrived in a much loved but also worn out ring. The antique platinum ring had experienced several generations of everyday wear and it showed. The setting was beyond feasible restoration so we did the next best thing. 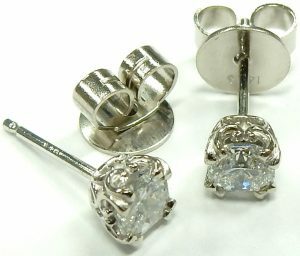 We recycled the platinum setting and made an amazing set of diamond studs. While the diamonds were loose we decided to have them fully certified at The Gemological institute of America in New York. They came back with outstanding results of VVS2-E and VS2-F. 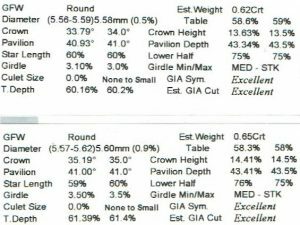 The fully plotted GIA grading reports can be seen online here 0.83ct. VVS2-E and 0.87ct. 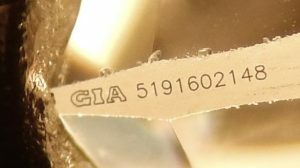 VS2-F. At the time of certification we also decided to spend a little more money and had each diamond microscopically laser engraved with the GIA certificate number. The permanent engraving is very useful if the original hard copy report should ever be lost or misplaced. While we’re confident this pair represent a unique opportunity and excellent value, we’re also quite sure there aren’t another pair of GIA certified antique diamonds similar to this for sale anywhere. The brand new 14 karat white gold settings are our most popular double gallery designs, equipped with heavy upgraded 6mm friction backs. 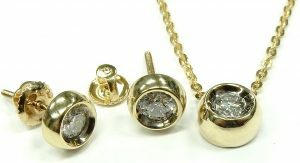 These diamonds have been together for 100 years, we’d like to sell them as a set only. If you’d like a different style of earring we will change the style for no charge. If you want to use them in a completely different type of jewellery we will deduct $175.00 from the price. Colourless and excellent clarity with distinctive optical characteristics that only antique European cut diamonds display. Seen in person the small table and chunky facets of these old diamonds sparkle like nothing else. Estate priced at $10,640.00 CAD. Stock #e11557. Sapphires have a distinct kind of inclusion called fingerprints. As you can imagine, under magnification these inclusions look like fingerprints. They’re caused when the sapphire is forming, fractures, and then heals, forming this radial pattern. You’ll run into minor fingerprints in faceted sapphires but when sapphires contain many inclusions they’re often cut into smooth cabochons. This trio of well matched cabochons contain many layers of fingerprints which do something quite unique. As the light is bent through the surface of each gem it hits those fingerprints and flashes back, creating areas of rolling blue brilliance reminiscent of moonstones adularescence. Those flashes stand out sharply from the darker blue depths of the combined 8 carats of sapphire. The three natural sapphires are a little suspicious to us. We feel their deep blue colour has been artificially enhanced by a some sort of diffusion dye treatment. As suspected treated stones, we’ve assigned no value as a factor in pricing the set. Each sapphire has been bezel set in hand made top quality 18 karat white gold bezels. Each equipped with either a sturdy bail or strong posts with large friction backs. The pendant is suspended from a 16 inch long Italian made square wheat chain maintaining its sparkling white rhodium finish. Being sold as a set only for the estate price of $840.00 CAD. Stock #e11070. BUYER BEWARE, know what you’re buying. This is an interesting pair of earrings from a large department store. Interesting because I’m puzzled by the price tag that came with them. With a weight of 1.0 gram, the 10 karat yellow gold pair of earrings contains roughly $22.75 worth of gold (with gold trading $1700.00 per oz. CAD.). It is of my opinion that brand new earrings of similar style and quality would have a retail price range of around $80.00 to $100.00 in a typical jewellery store. Once all the manufacturing costs, several levels of distribution, wholesale and retail markups are considered it is not uncommon for earrings to sell for 4 times the intrinsic value of the gold they contain. 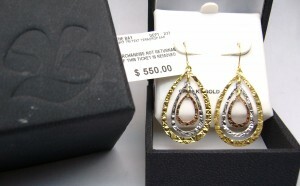 With a price of $249.00, the ratio of gold value to retail price on these earrings is almost 11 times. It would be interesting to know if this store typically sells these earrings for $249.00 or do they confuse the consumer with a huge discount. Be an informed shopper, find out how heavy the item is and what value of gold the piece contains. Learn the factors that determine the value of jewellery. Most jewellery is not sold by just the weight, but if you know what it costs per gram it is much easier to gauge the value of similar items at different stores. All that being said these earrings are brand new and very attractive. They have only been taken out of the original box to be weighed and photgraphed. The satin and bright cut finish sparkles and twinkles. 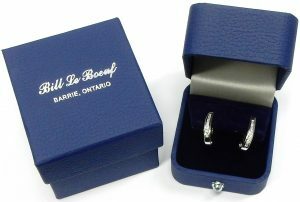 Including the original box or a Bill Le Boeuf Jewellers box (without the original price sticker) they are estate priced at $56.00. Stock #e11272. Do you know a little princess who would love a really cute earring and bracelet set? 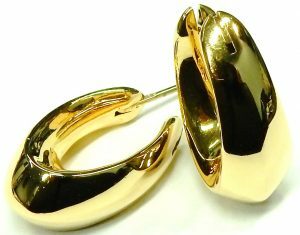 Sensitive little ears will appreciate the high quality 18 karat yellow gold this set was crafted from and the strong spring loaded hinge back is simple to put on. 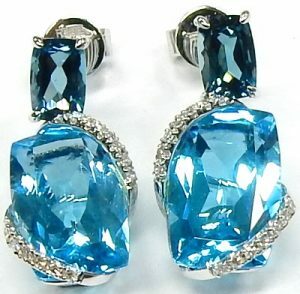 Weighing 2.0 grams the earrings are estate priced at $192.00. Matching the earrings is an 18 karat yellow gold bracelet measuring 5.75 inches in length and weighing 3.0 grams. The bracelet is secured by a good sized lobster catch with a strong spring. Both pieces are in perfect condition and are brand new in appearance. The bracelet is estate priced at $245.00 CAD and is available separately. Stock #e8450. If huggies are the most secure hoop earring available on the market, then these are the best of the best. The back of each earring is designed with an extra hole for the post go through. The post snaps tightly into the first, with the second protecting against accidental opening. The secure duo are each made from a robust 3.2 grams of 14 karat white and yellow gold. The white gold fronts are protectively channel set with a combined 0.33 carats of twinkling I1-I round brilliant cut diamonds. Measuring an all occasion 16.5mm long the hoops are perfect for daily wear. Estate price $770.00 CAD. Stock #e10497. Once again the Italians show us why they’re the best when it comes to high end hollow jewellery construction. This seemingly simple earring set was manufactured from no less than 10 individual components. Assembling the mirror image yellow and white gold set takes incredible skill. Keeping every piece in perfect alignment and soldering it all together without melting the tubing or freezing up the hinged wire is a task only a talented goldsmith of foolish one would undertake. 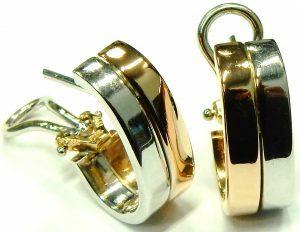 The 28mm x 20mm earrings are very good condition showing an excellent polish only premium 18 karat can. Just over 4 grams finished weight and estate priced at just $350.00 offers excellent value. Stock e11475. Jewellery detective is one of the many hats we get to wear at Bill Le Boeuf Jewellers and personally it’s my favorite role. This dazzling little puzzle came in its original box, which never happens with pieces this old. 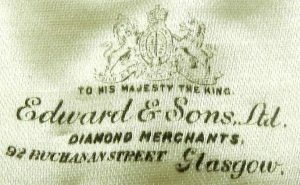 The box gave us a starting place for determining age, first there was a business name Edward & Sons, Ltd. Diamond Merchants of 92 Buchanan St. Glasgow. The business opened originally in 1838 under the name George Edward & Sons but dropped the George in 1925. Meaning this piece was made some time after that. The royal Coat of Arms with “To His Majesty The King” is a Royal Warrant and means that Edward & Sons provided a member of the British Royal Family with jewellery for at least five years. Beyond the box we can date the earrings by their ingredients. The 40 round diamonds that decorate the pair are a mix of old single cuts, single cuts, and transition cut diamonds. These cutting styles are indicative of the 1910s to the 1930s. The two baguette cut diamonds add to the 1920s timeline as the cut wasn’t used until the beginning of that decade. With their geometric hall of mirrors optical effects they quickly became a favorite of Art Deco goldsmiths. All told the historic diamonds add up to an estimated 1.31 carats total weight. The diamonds range in quality from VS2-I1 clarity and G-J colour. The central 8.2mm Japanese demi pearls could be natural but are believed to be cultured. If that is the case pearl culturing wasn’t invented until 1916 and by the 20s cultured pearls were everywhere. It doesn’t take that much digging to determine that the handmade platinum and 18 karat white gold pair are late Art Deco. The 30mm long drops are all millgrain with delicate geometrics, that ornamental, opulent quality defined the decade. 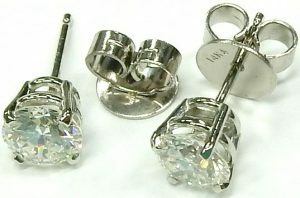 Currently the earrings are equipped with non-pierced threaded backs but can be converted to posts. 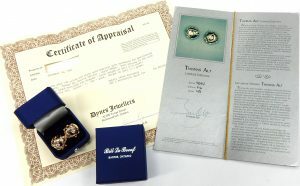 The pair not only come with their original box but also a December 2011 appraisal from Harold Weinstein Ltd. stating an estimated replacement value of $6100.00. 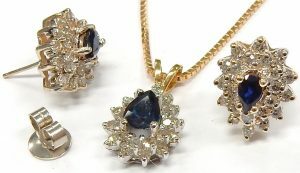 Our estate price $2590.00 CAD represents fantastic value for this one of a kind antique earring set. Stock #e10974. Earrings remain one of our most popular estate items. Hoops and studs are the most often requested style. 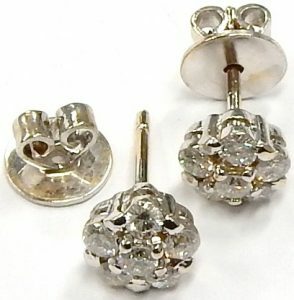 This pair of vintage studs was a admired form 50-60 years ago and is still occasionally seen today as new production. The raised floral buttercup design frames the diamonds in 6 sturdy claws of white gold. 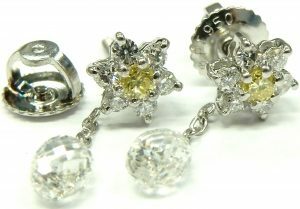 Each earring contains a bright I1+ clarity diamond with a very nice H colour. These earrings weigh a combined 1.2 grams and are secured by strong friction butterfly backs. Each diamond measures 3.45mm diameter and are estimated to weigh a combined 0.30 carats. Estate priced at $343.00 CAD. Stock #e10770. The lesser known of the diamond earring staples is the huggie hoop. A well built pair in a petite diameter can be worn constantly. The clean lines of the channel setting style balance the brilliance of the diamonds for a subtle and sophisticated look. Our pair measure 13.4mm diameter and are made of a comfortable 3 grams of 10 karat white gold. Together they carry 0.25 carats of nice SI-HI round brilliant cut diamonds. Estate price $413.00 CAD. Stock #e11285. Diamond studs are some of our favorite estate items. Usually all that is required to prepare them for our estate department is to thoroughly clean them and perhaps upgrading the backs to something a little more secure. Our customers love them too as the simple style of most studs makes them very versatile. 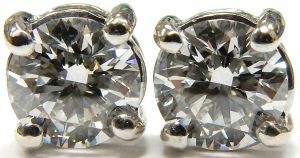 Although the diamonds in this pair weigh just 0.25 carats they look much larger. The interesting triangular cup setting does a fantastic job of fooling your eyes into thinking they are close to twice this size. Despite just two points of contact with the setting the diamonds are very secure leaving the the majority of diamond to brightly sparkle. The parabolic polished rhodium inside surface acts as a little mirror focusing light toward the diamonds further enhancing the illusion of a larger stone. The 14 karat white gold earrings weigh a combined 0.8 grams, each containing a well matched I2-GH round brilliant cut diamond of surprising brilliance. Good quality friction backs secure the pair without the need of clumsy screw backs. They’re an interesting alternative to traditional 4 prong settings. Estate priced at $280.00 CAD. Stock #e11308. A modern take on two tone is rose gold paired with chromy rhodium finished white gold. The soft blushing tone works well against neutral white, allowing both to stand out boldly during wear. The unadorned high polished surface of the 20mm long by 7.2mm wide set adds to that modern feel. Though hollow the Italian made pair still ends up weighing an impressive 5.6 grams of 14 karat white and rose gold. Finished with strong omega backs and sturdy posts the set is in like new condition for the estate price $438.00 CAD. Stock #e10501. If you’ve been lurking our website waiting for that elusive pair of princess cut stud earrings to show up, here’s your chance. They’re big but no so big that the price becomes out of reach. Each diamond is extremely well matched in every respect. They are almost perfectly square measuring close to 4.5mm x 4.5mm, both are the same SI1 clarity and both are of nice “I” colour as compared to our GIA master stones. We’ve just finished assembling the matching diamonds into brand new American made 14 karat white gold, heavy gauge double gallery settings. Super strong oversized friction backs keep the studs in place and add extra security. The small claws holding the diamonds in place do not cover the corners resulting in a very clean modern look. A finished weight of 1.4 grams may not sound like much, but with sky high gold prices you’re not likely to find heavier or better quality than these. The best part about the pair is the great value offered because the diamonds are estate items. Don’t wait long, this pair won’t last. Estate priced at $2,695.00 CAD. Stock #e9948. We ship duty free to the USA and elsewhere. No expense was spared when these stunning one of a kind earrings were created. 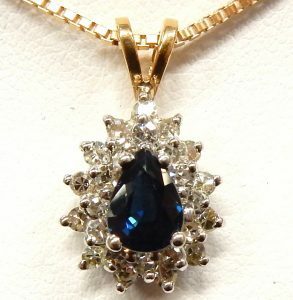 Each contains one 0.75 carat natural blue pear shaped sapphire of excellent quality. They are each surrounded by graduated, sparkling, VS-H quality round brilliant diamonds with an additional diamond set into a millgrained bezel just below the ear wire. Total diamond weight is estimated at 2.10 carats. These things are so bright they would almost sparkle in the dark. Well made from 7.5 grams of brightly rhodium finished white gold and equipped with super secure locking lever backs that have to be released by hand. These earrings are heirloom quality. The kind of quality you seldom encounter today. Two words; “absolutely beautiful”. Estate price $6125.00 CAD. Stock #e9437. Synthetics are often confused with imitations or simulants. The latter is something else trying to look like a certain gemstone, but synthetics are that gemstone. A synthetic gemstone and a natural gemstone are physically and chemically the same, the only difference is that one formed over thousands of years in nature, the other over months in a laboratory. The advantage of the synthetics are numerous, first they can be made on demand so they are not rare and are much less expensive. Second, because they are made in a controlled environment synthetics almost always form in a much higher quality than their natural counterparts. Take these synthetic emeralds for example, emeralds naturally formed are heavily included with colours ranging from washy light green to inky dark green. The 12 synthetic emeralds at the center of these heart drops are eye clean, brilliant, and the perfect colour of candy green. Setting off that bright green is a halo of petite accent diamonds set into rhodium enhanced white gold. The 0.10 carats of diamond are accented by millgrained yellow gold and a heart patterned undergallery. Each heart measures an all occasion appropriate 9.9mm x 11.1mm and are equipped with fixed curved posts and hinged backs. 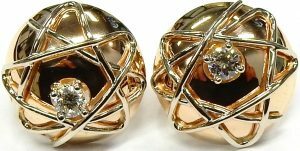 Estate price for the 14 karat 2.9 gram pair $350.00 CAD. Stock #e10972. 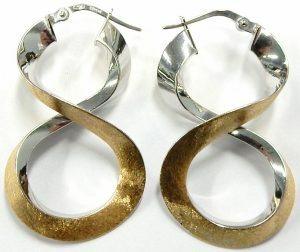 They don’t come in nearly often enough and you keep asking for Huggie style hoop earrings, so here’s our latest pair. At 19mm diameter they’re just slightly bigger than a Canadian dime. The simple design each contain a channel set row of small round brilliant cut diamonds estimated to weigh 0.40 carats in total. With an average quality of I1-J they sparkle well enough and keep the price from getting out of hand. The substantial weight of 4.4 grams is quite a bit more than a regular tubular hoop of hollow construction. The curved wire locking posts are just the right length to completely disappear when securely snapped shut. There here today but who knows how long they’ll be around priced at just $520.00 CAD. Stock #e11319. Our customers really love hoop earrings. Plain, patterned, with or without diamonds. 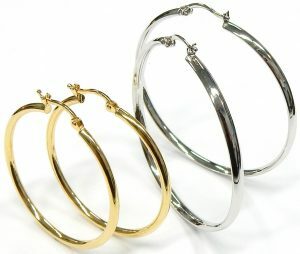 Hoops usually disappear not long after they been put on display or posted on our website. The pair is a little larger than most measuring a bit bigger than a quarter. They weigh more than a quarter at 4.7 grams. Perfect condition looking unworn, they show great contrast between the highly polished and sand blasted sections. Properly riveted hinged wires securely lock into a tight spring tensioned receiving clip. Made from higher quality 14 karat gold the earrings should be safe to wear for those with more sensitive ears. The colour of 14 karat is a little richer than the 10 karat industry standard. Estate priced at $350.00 CAD. Stock #e11025. No dents, no dings, classic drop design with French backs made by BIRKS, what’s not to love? 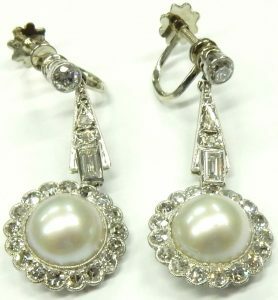 High quality earrings are among the most requested estate items we have. We never have enough of this type of thing, so if you like them don’t wait. Light weight and very comfortable. At first glance they may appear to have a simple random fluid pattern but upon closer inspection they are exact mirror images of each other around the entire circumference. Proper riveted spring loaded backs ensure once they’re on they stay on. Traditional 14 karat yellow gold with a finished weight of just over 2 grams. 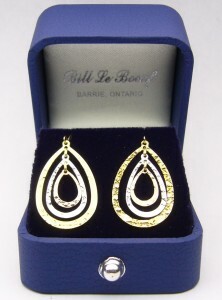 Estate priced at just $203.00 and only at Bill Le Boeuf Jewellers. Stock #e11080. There are so many great little estate items that never make it to the pages of our website. Photographing and describing everything takes quite a bit of time. There are simply not enough hours in a day to possibly show you everything we have. These earrings looked so nice we had to quickly show them to you. 22mm in diameter and in perfect condition. Square tube construction is highlighted on the sides with rhodium plated bright cutting resulting in twinkle and bling without the expense of diamonds. The effect is quite attractive and can’t be captured with our poor photography skills. No dents or dings and freshly polished. Estate priced at only $105.00 CAD. Stock #e11287. 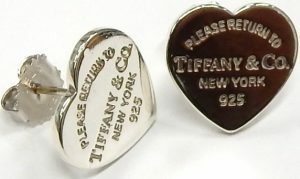 A current offering from Tiffany Jewellers where they sell for $340.00 CAD. The pair is in very good condition displaying all the original T&Co. hallmarks on posts and backs (one of the original butterfly friction backs has been substituted with a generic replacement). The earrings are freshly polished and ready to go in their original travel pouch. They pair is estate priced at $100.00 CAD. Stock #e11183. Good sized diamond stud earrings are nothing new for us. 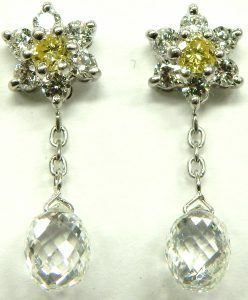 We’re continuously taking earrings in on trade for upgrades and making up new examples for our inventory all the time. Usually they show up with weak flimsy friction backs. Those cheap light flimsy butterfly backs immediately go into our recycling and get upgraded to brand new heavy weight examples. Our newest estate diamond earrings needed no upgraded hardware. They came to us with top of the line spring loaded clutch backs. The patented design have 2 precisely machined grooves on the posts that work with the spring loaded disc backs providing an extremely secure locking fit. The only way to escape their bite on the post is to push both buttons on the disc with your fingers. It’s a low profile sophisticated design that really works great. The setting portion is pretty standard; popular four prong double gallery design is both flattering and easy to clean. The diamonds are a nicely matched set of I1-HI quality diamonds with a total estimated weight of 0.70 carats. The set are estate priced at $1120.00 CAD. Stock #e11181. “Cut” is the forgotten C for many consumers but it is easily as important as the other 3Cs (colour, clarity and carat weight). 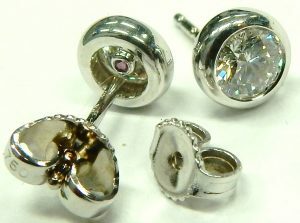 If you have any doubts of just how important cut is, come in and have a look at these solitaire studs. They each measure 5.63mm diameter; perfect for a matching set weighing 1.35 carats. As you can see, the picture reveals both are a strong I1 clarity (according to our strick GIA trained standards) with a very good G colour. What you can’t see in the picture is how brilliant the pair are, so much so the just barely eye visible inclusions are nearly lost in brilliant flashes of white and every other coloured spectral flash. The slightest movement sets the 1.35 carat pair on fire. They’re secured into high quality, four prong, double gallery, rhodium enhanced, 14 karat white gold settings. For added security the studs are equipped with threaded backs and posts. Just make sure to check the backs once in a while to see they haven’t loosened off. Way more bling than $3101.00 CAD should buy. Super nice, amazing value, I really like these ones. Stock #e10368. Though we don’t recommend wearing many pieces of jewellery (especially earrings) 24/7 these huggies are more than up to the task. Each weighs 2.7 grams, a testament to their quality considering they only measure 17mm long. 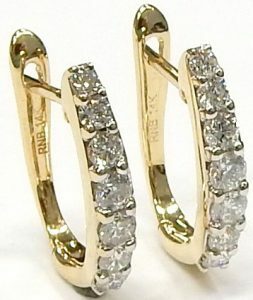 The 14 karat yellow gold hoops are set with specially cut baguette and princess cut diamonds. Each earring holds an estimated 0.50 carat total diamond weight. The I1-IJ quality diamonds play perfectly off of each others contrasting facet patterns. 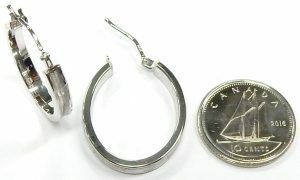 The hefty hoops have been equipped with thick hinges, strong fixed posts, and catches that bite and hold the earrings securely closed. Estate price $700.00 CAD. Stock #e11239. This pair of diamond studs was purchased at Bill Le Boeuf Jewellers many years ago. The original owner decided it was time for a more substantial pair so she traded them back to us. Set in a traditional 14 karat yellow gold four prong crown setting the earrings contain 2 very well matched SI2-I1-I diamonds. Both diamonds have minor white feathers positioned close to the edges making them appear much higher in clarity. Very good cut with lots of sparkle they’re ready to be enjoyed by someone new. We’re always interested in high quality jewellery for our estate department. If you’re not wearing something anymore bring it in, we can buy it outright or trade it in for a premium and possible save some tax too. 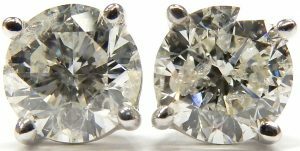 This pretty pair of diamond studs is estate priced at $595.00 CAD. Stock #e10499. Yellow gold is back and estate earrings continue to be just about the most popular items among our estate offerings. If most of your jewellery is silver or white gold you should test the waters with this pretty pair of oval hoop earrings. The Florentine textured finish does a great job of showing off the unique colour of traditional yellow gold in a subtle manner. Well constructed using 1.7 grams of seamless gold tubing capped with solid ends. The ear posts are hinged square section wire for added strength. No dents, no dings in like new condition. Estate prided at only $91.00 CAD. Stock #e11051. An interesting study of subtle variety often found in popular jewellery motifs, as each retailer struggles against the competition to find some way to make their version stand out. The more desirable between the two is more a matter of taste really, as both have merits over the other. The larger pair consists of a four section knot measuring an impressive 14.5mm wide. They boast a weight of 5 grams and are manufactured from top quality 18 karat yellow gold. They are surprisingly sturdy considering they are still of hollow construction. They’ve been equipped with crispy springing hinged backs to seat them just below the ear lobe during wear. To accompany their robust nature these love knots are estate priced at $490.00 CAD. Their competition is of a totally different strain, understated at a comparatively petite 8mm wide. 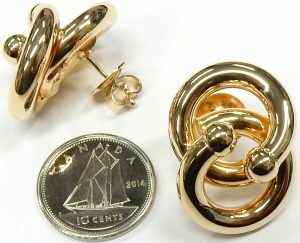 The three piece knot consists of a lighter 1.6 grams of 10 karat yellow gold. This pair however has been gifted with very secure french backs that need to be pinched to release their strong bite. The estate price on this pair is an appropriately less, just $91.00 CAD. Both make a sweet statement in their own right. Stock numbers e10526 and e10527. Super casual with just a bit of sparkle. 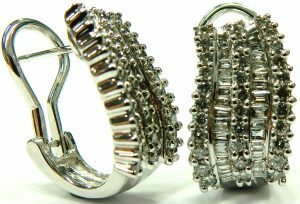 The Huggie style earring has been a huge success since its introduction many years ago. The simple style does exactly what you’d expect, they hug your earlobe with just a small 5mm gap between the tightly hinged sides. The 14mm earrings snap securely closed without any fuss. No need to line up a threaded back or butterfly. This style of earring can be worn all the time. Many people wear them 24/7 with no sharp exposed post to stab you in the head if you wear them to sleep. Each earring contains a small 0.03 carat round diamond of SI-I quality providing just enough sparkle. The earrings show some shallow scratches from previous use on the rhodium enhanced front surface. We can easily polish these scratches away in a minute or two if you wish. The sides of the earrings are textured with a brushed flat finish resulting in a more casual look. Made from 3.5 grams of 14 karat white gold and estate priced at $333.00 CAD. Stock #e10986. We’ve got em and we’ve got a lot of them. 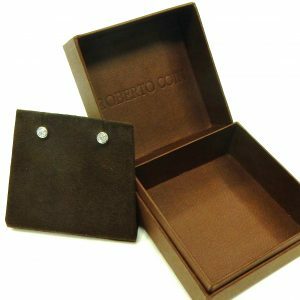 Diamond studs are a jewellery staple that our customers are continually upgrading and trading in. We have so many that it would be almost impossible for us to showcase all of them. 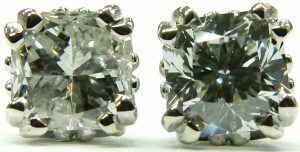 Not only do we have plenty of ready to go estate earrings we also have lots of loose estate diamonds that we can make up into a pair of earrings in just a few hours. This pair is especially attractive with their very nice GH colour and extra strong I1 clarity. We challenge you to find a better looking pair of I1-GH diamonds than these. Our extremely aggressive grading standards means you’ll never be disappointed buying a diamond from us. Our two GIA certified diamond graders are very strict when it comes to placing a grade on our diamonds. 60 years of hard earned reputation and respect for our customers is our motivation. 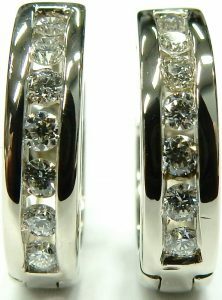 The pair of excellent cut diamonds are set in three prong white gold double gallery settings with snug fitting and secure friction back and are estate priced at only $560.00 CAD. Stock #e10985. 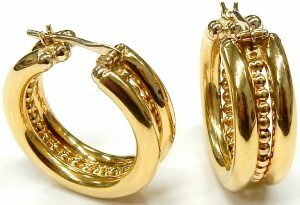 Hoops, drops and stud earrings are continuously showing up in our estate department. Earrings are some of our most popular jewellery items. Our estate diamonds in new stud settings program has been a customer favorite for as long as we’ve offered this service. It’s a great way to get a new pair of diamond studs for amazing prices. Sometimes a pair of ready to go studs come in that deserve a specific posting. 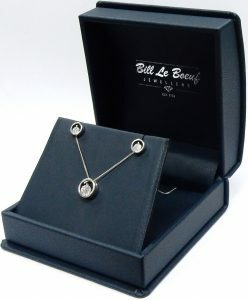 In the 30 plus years I’ve been a part of Bill Le Boeuf Jewellers this is only the second pair of oval cluster studs that I can remember. Matching a pair of round diamonds is a pretty straight forward task because round diamonds are so plentiful and a single diameter is really the only critical dimension to consider. Oval diamonds are far more difficult to pair up as they only represent around 5% of all diamonds and each one has a different length to width ratio. This pair features a nicely matched duo of oval brilliant cut diamonds estimated to weigh by mathematical formula 0.20 carats each. Each one is surrounded by 10 small single cut diamonds weighing 0.0075 carat each. All the diamonds are of a minimum SI1-H quality. The 14 karat white gold settings are in like new condition still retaining their original bright rhodium finish. The 0.55 carat total diamond weight earrings are right on point to match today’s popular halo style rings. The complete set weigh 1.6 grams and are secured by brand new super snug fitting butterfly friction backs. Estate priced at $840.00 CAD. Stock #e10821. Princess cut estate diamond studs appear far less frequently than round studs do. When a popular size, good quality pair come in at a great price don’t wait too long. In fact don’t wait at all. Don’t walk, run down here right now and pick them up. The popular style four prong double gallery design is safe, durable, easy to wear for any occasion and very flattering for square stones. The flat edged, wire box design matches the right angle geometry of these square modified brilliant cut aka princess cut diamonds perfectly. By the measurements of approximately 3.6mm x 3.6mm and mathematical formula we’ve calculated the diamonds to each weigh 0.25 carats. Microscopic examination reveals small included crystals that qualify the diamonds for a conservative SI2 clarity grade (many would call them SI1). Compared to our GIA master diamonds we feel they colour grade to a G. The 14 karat white gold settings are secured by snug fitting friction backs and weigh 1.1 grams in total. 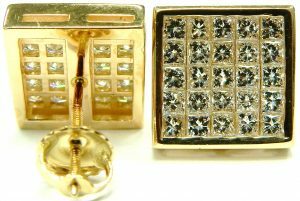 As mentioned, if you’re looking for a nice pair of square diamond studs for everyday wear you can’t go wrong with these ones for the estate price of only $840.00 CAD. Stock #10832. Citrine are one of those gems that flies under the radar. It’s the traditional birthstone for November, plentiful and inexpensive yet you don’t see too much of it in modern jewellery design. The octagon halo frames do a great job flattering these rich brownish yellow quartz gems. A contrasting row of bright, high quality VS-H round brilliant cut diamonds elevate the citrine to the luxury position this stone deserves. Each 7.0mm x 7.0mm citrine is estimated to weigh 1.25 carats. 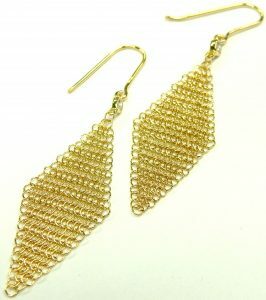 A delicate lattice gallery adds to the quality look and feel of these earrings. 3.3 grams finished weight in 14 karat yellow with generous snug fitting butterfly backs finishes the pair. Excellent overall condition. We’ll gift wrap them in our blue and white satin gift box for the November birthday girl in your life, or for the person who appreciates the rich earth tone of these stones. Estate priced at $560.00 CAD. Stock #e10470. For people with multiple piercings in their ears huggie style earrings always work. You can wear them on the bottom of your ear like a traditional small hoop or wear them anywhere up your ear looking link a small cuff. This pair was made from 10 karat white gold with upgraded 14 karat wires for those with sensitive ears. They weigh over 2.5 grams and measure 14mm diameter. The machine cut and engraved surface pattern gives the earrings an interesting wave optical effect with even the slightest movement. Excellent condition with no wear in the hinges and still retaining the original factory rhodium finish. Estate priced at $140.00 CAD. Stock #e10803. I wish this sort of earring would come in more often. Almost as soon as a pair of white gold huggie earrings comes they’re sold. The huggie style has become one of the most popular and for good reason. They’re super comfy, very secure and are quite versatile. They can be worn every day or dressed up with diamonds or pearls in this case. The small 12.5mm diameter hoop is enhanced with a good quality 6.3mm pearl drop that ads some motion with a hinged bail. The snug huggie design does just that. They hug you’re earlobe with just a 5mm gap between the sides. This style of earring means no protruding post is going to poke you in head if you happen to wear them to sleep. The earring are made from brilliant white rhodium enhanced 14 karat gold with a finished weight of 3.7 grams. Don’t wait too long or these will disappear just like the last nice pair that came through our estate department. This pair is estate priced at only $280.00 CAD. Stock #e10987. Good things do come in small packages. 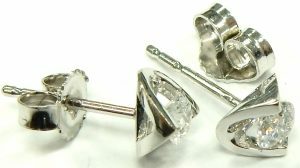 These very high quality 18 karat white gold stud earrings measure just 8.6mm x 7.6mm but contain some pretty impressive stones. Nice diamonds are a rare treat to see in stud earrings (especially clusters). The 16 round brilliant cut diamonds that circle the emerald are of an easy SI clarity with an estimated FG colour. All together the brilliant white halo of bling are estimated to weigh half of a carat. The soothing green natural emeralds at the centre are estimated to weigh 0.15 carats each. They are of excellent deep green colour with great transparency seldom seen in emerald. 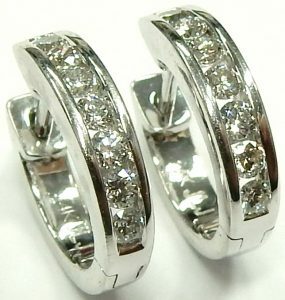 The earrings are secured by brand new, palladium alloyed 14 karat white gold friction backs. Extra heavy backs like this provide far more security and the 6mm pad help keep the earrings facing straight. Perfect like new condition and estate priced at $910.00 CAD. Stock #e10971. They’re a jewellery box necessity, the classic hoop earring. Casual or dressy the soft rounded profile always look great. 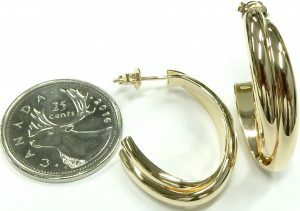 Goldilocks earrings; they’re not too big and they’re not too small; at 25mm diameter they’re juuuuuust right. No dents, no dings, no scratches, not even a scuff, perfect in every way. Beautifully finished with soldered end caps and strong, proper riveted ear wires.These earrings may be light with a finished weight of 2.77 grams but they are big on simple elegant style. This pair could easily turn into your favourites. Made from seamless oval tubing they are strong but light; you won’t even notice your wearing them. Each earring was manufactured from 7 different 14 karat yellow gold components all meticulously assembled with perfect finish. Easy to use and very secure. Yellow gold is back looking as beautiful as ever. The pair is estate priced at just $180.00 CAD. Stock #e10713. Tiffany & Co. describe Elsa Peretti’s body of work as organic and sensual, her jewellery designs seducing the world. It’s hard to contest that description looking at her Mini Mesh earrings. The two inch long textiles are woven from the most delicate threads of 18 karat yellow gold. Interlocking links curl and drape gracefully during wear, drawing the eye in and up to top quality 0.03 carat round brilliant cut diamonds that crown each earring. 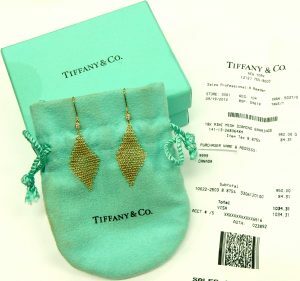 The elegant pair are accompanied by its original Tiffany & Co. box, travel pouch, and U.S. sales receipt. Currently listed on Tiffany’s website for $1350.00 CAD, our estate price $810.00 CAD. Stock #e10650. If you are a fan of symmetry, straight lines and geometric precisions, perhaps a set of square modified brilliant cut diamonds are your preference when it comes to diamond studs. Princess cut diamonds like these are encountered far less often than traditional round brilliant cut studs that come and go frequently in our estate department. These nicely matched diamonds are of unusually high quality when it comes to earrings. With a VS1 clarity and a H colour they sparkle as well as any. The fishtail claw double gallery 14 karat white gold settings are brand new. We’ve added high quality 2 piece 6.0mm friction backs to secure the studs with a constant and strong grip. The large disc also provides some extra support that keeps the diamonds from drooping forward. We feel high quality diamonds deserve high quality settings. High quality doesn’t mean high price when your shopping our vast inventory of estate jewellery at Bill Le Boeuf Jewellers. 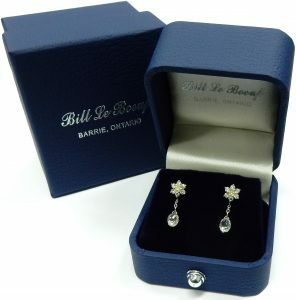 This 1.6 gram set of diamond studs are estate priced at just $2681.00 CAD. Stock #e10454. Don’t forget about some of the smaller items in our estate department. We can’t possibly profile every single item that comes in, but from time to time we like to remind you about some of them. 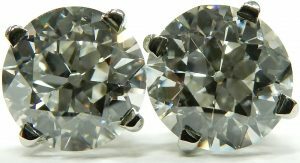 A great example is this cheap and cheerful pair of diamond stud earrings. The clever method in which the diamonds are set will make you swear the pair are close to 1 carat in weight with the 5.0mm overall diameter. 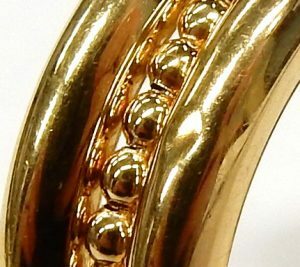 The overlapping setting technique means there is very little gold covering the diamonds. This allows the modest I2-IJ quality to sparkle and reflect more than you’d expect for so little money. 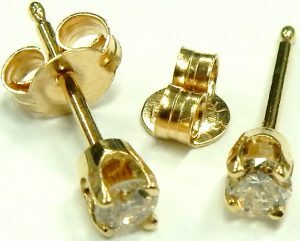 The 10 karat yellow gold stud settings have been rhodium enhanced on the front further promoting the high end look. The 0.9 gram set contain 14 round brilliant cut diamonds weighing a conservative 0.20 carats total weight. It might just be the most bling you get for just $8.75 per diamond. The pair is in excellent condition and is estate priced at just $123.00 CAD. Stock #10756. Christmas is coming; you’ve got the frying pan and shiny new mixer for her but don’t forget at least a little bling for the stocking. You’ll be surprised how well a small jewellery item like this will go over. Even the name is appropriate, how could you not appreciate a pretty pair of “Love Knot” earrings. 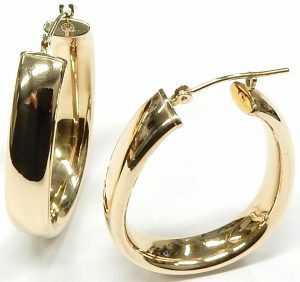 This pair of well made gold earrings weigh over 1.7 grams and are made from 14 karat yellow gold. They’re in perfect condition showing not a single scuff or scratch. To ensure they stay put we’ve supplied brand new upgraded heavy gauge friction butterfly backs. Earrings quite often sell faster than any other of our amazing estate offerings. It’s Christmas time and things like this don’t hang around too long. We’ll even do a fantastic no charge gift wrapping job for you. Estate priced at only $126.00 CAD. Stock #e10874. 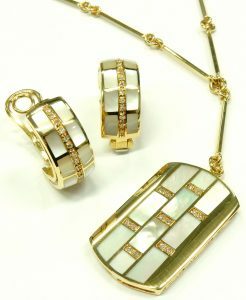 Simple and elegant the interlocking white and yellow gold drops will make an understated finishing touch to any outfit. High quality and expertly manufactured in Italy where they just seem to have a level fit and finish few can compete with. The heavy gauge hollow constructed set weigh in at 6.7 grams in 14 karat gold. Each earring measures 20.6mm long by 15.25mm wide and retain their original high polish with rhodium plating. Equipped with spring omega backs for added security and comfort. Estate price $525.00 CAD. Stock #e10502. You need to be quick with the speed dial or email sometimes if you’re considering a purchase from our ever changing inventory of unique estate items. Earrings seem to be one of the most quickly snapped up items around here. We only sell examples that are in excellent condition and this oval pair is no exception. Made from hollow triangular tubing makes them super strong relative to their weight and less prone to dents compared to round tubing. Measuring 35mm x 20mm they drop nicely below the earlobe yet are not difficult to wear. Made to the highest standards in Italy they come equipped with properly riveted hinges and joints (no pinch closed hardware) for extra security. The original factory applied bright rhodium finish is still completely intact. 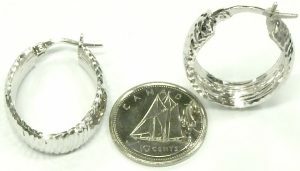 If earrings are your thing this 2.3 gram set makes a great, slightly dressier alternative to a traditional round hoop. If you like em buy em cause they don’t come in everyday. 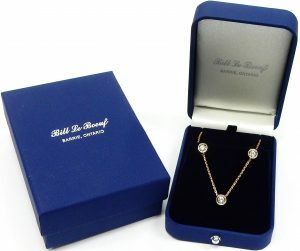 Send us an email to info@billleboeufjewellers.com. We also ship throughout North America all the time. Estate priced at $168.00 CAD. Stock #e10742. BEWARE OF BLACK FRIDAY BARGAINS. 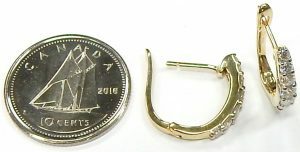 This is an interesting pair of earrings from a large Canadian department store. Interesting because I’m puzzled by the price tag that came with the earrings. 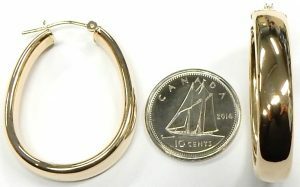 With a weight of 1.8 grams, this 14 karat tri-colour gold pair of earrings contains roughly $55.00 worth of gold (with gold costing $1600.00 per oz. CAD.). It is of my opinion that brand new earrings of similar style would have a retail price range of around $225.00 in a typical jewellery store. 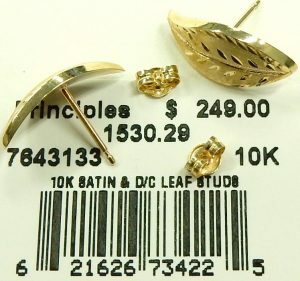 Once all the manufacturing costs and several levels of distribution, wholesale and retail markups are considered it is not uncommon for earrings to sell for 4 to 5 times the basic intrinsic value of the gold they contain. At $550.00 as the price shows, the ratio of gold value to retail price is 10 times. It would be interesting to know if this store typically sells these earrings for $550.00. Be an informed consumer. Find out how heavy the item is and what value of gold the piece of jewellery contains. Learn the factors that determine the value of jewellery. Most jewellery is not sold by just the weight but if you know what it costs per gram it is much easier to gauge the value of similar items at different stores. All that said the earrings are brand new. They have only been taken out of the original box to be weighed. The hammered texture sparkles and twinkles as the jointed sections move about. 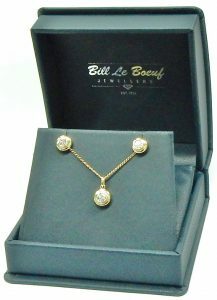 Including the original box or a Bill Le Boeuf Jewellers box they are estate priced at $129.00. Stock #e8574. We have a varied collection of estate heart inspired jewellery but we don’t have any other dangling heart earrings that flash like this pair. The white gold bright rhodium enhanced domed hearts are bead set with 0.50 carats of I1-HI diamonds that throw light every time they move on the hinged drop. Weighing 2.8 grams and measuring 9mm tall by 10mm wide the hearts are guaranteed to get attention while hanging securely from their yellow gold lever back hooks. Estate price $525.00 CAD. Stock #e9642. Always a favorite, diamond stud earrings. High quality and set extremely low at a great price should guarantee these don’t last long. 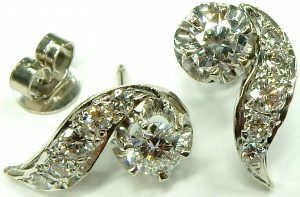 These are high quality diamonds that you don’t see too often in stud earrings. One is an easy VS clarity while the other is a very good SI1 and both are a well matched H colour. The simple bracket setting gives them a very low profile that many customers ask for. Another case of a client upgrade for something bigger gives you the opportunity to get a great set at a fantastic price. The 14 karat white gold set are secured by snug butterfly backs. Finished weight of 0.7 grams. Estate priced at $420.00 CAD. Stock #e9502. 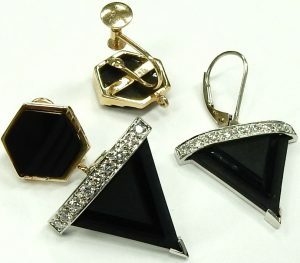 There are many ways to display and showcase the basic stud earring. A thick bezel setting is one method that really displays a brilliant cut well. The highly polished 14 karat white gold frame setting almost doubles the perceived diameter of the diamonds they hold. Not that the diamonds need much help making an impression with their bright SI2-H quality and combined weight of 0.58 carats, they’d stand out easily on their own. That decorative frame of white gold does make the diamonds look brighter and uber modern too. For added peace of mind the 1.5 gram studs are secured with strong threaded backs and posts. Estate price $966.00 CAD. Stock #e10319. 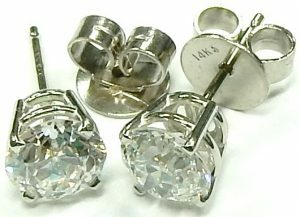 Sometimes diamond stud earrings aren’t given too much thought from both manufactures and consumers alike. We see mismatched diamonds, haphazardly assembled, super lightweight settings all the time. Once in a while we see a set that are excellent in every way. This pair is just one such set. The 0.9 gram 18 karat white gold double gallery settings are both very flattering and easy to clean. Both diamonds are a perfectly matched SI1 clarity with a very good G colour. They both measure 3.8mm diameter and are estimated to weigh 0.40 carats in total weight. The earring posts have been threaded to accept snug fitting screw on backs offering an extra level of security. Quality, condition and price are the factors coming together with this set to equal outstanding value. Like new condition with the original scratch free rhodium finish completely intact. Estate priced at $630.00 CAD. Stock #e10728. Another one of the smaller estate items that almost didn’t make it onto the pages of our website. There are many items in our displays that deserve some internet exposure but we just don’t have the time to showcase everything online. 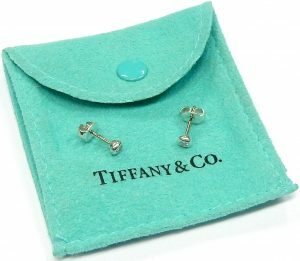 This pair of stud earrings while certainly not expensive, have a great show packed into their diminutive 5.25mm x 5.25mm outline. They contain 8 small invisibly set princess cut diamonds of modest I2-J quality. The bezel set 14 karat yellow gold mounting helps the multiple diamonds look like a single much more expensive solitaire. Under close inspection we found a tiny chip on one of the corners of one diamond (right side earring bottom right corner of the bottom left stone). Without lots of magnification this tiny blemish is invisible. We’ve made a price adjustment to reflect this invisible defect. The safety and integrity of the other components is not compromised in any way by the minor chip and it’s likely been there since the pair were new. Yellow gold is making a comeback, these are an inexpensive way to try out yellow gold or get back into the traditional colour of fine jewellery. 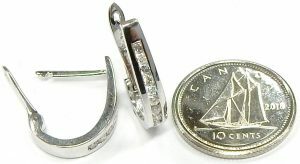 Weighing 1.2 grams in total weight they are estate priced at only $147.00 CAD. Stock #e10697. Someone put a lot of time and effort into recreating this pair of emerald and diamond drop earrings. They are made of 18 karat yellow gold and sterling silver as would have been the practice from the 1800’s as white gold had not yet been developed. Each earring contains 8 bezel set emeralds of good colour and quality along with 44 bead set round brilliant cut diamonds. The total gem weight is approximately 3.50 carats. The pair weigh 10 grams and are secured by stud backs. The estate price of $2800.00 includes two previous appraisals from 2003 and 2008. Stock #e6339. Yellow gold is coming back in fashion and we’re big fans of the traditional colour. White gold is great and super popular right now but yellow gold blends with any skin tone allowing the diamonds to be the focus. Yellow gold also doesn’t require a plating to intensify the natural attractive colour. With these inch long graduated drop earrings the diamonds appear at a glance to be floating while being worn. The 1.00 carat total weight of sparkling I1-HI round brilliant cut diamonds are made even more enchanting by their ability to move independently from one another as they are jointed in two places. The hinged link sections keep the 14 karat yellow gold drops in constant, scintillating motion. For peace of mind each earring is equipped with heavy friction backs. Estate price $1050.00 CAD. Stock #e9930. There is no interpretation of the diamond solitaire stud more elegant than these, draped in a swirling ribbon of bright white 14 karat gold. That freeform curve is a surprisingly versatile wear that looks equally interesting worn in any direction, especially when the diamonds they house show so beautifully from all angles. The two I1-HI round brilliant cuts come together to make an impressive 0.68 carats of showy Canadian excellence. 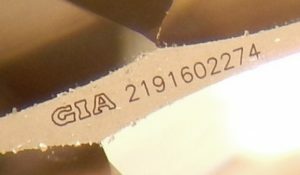 As with all Canadian pedigreed diamonds the girdles have been laser inscribed with a unique serial number and microscopic maple leaf as proof of origin. The 2.6 gram studs are each equipped with the strongest friction backs available, ensuring stress free wear. Estate price $980.00 CAD. Stock #e10229. Diamond earrings are one of the most popular items with our clients looking in our estate jewellery department. Some reasons for the popularity are obvious; estate jewellery often costs half of what you’d pay compared to new. Another reason is earrings don’t suffer the type of wear and tear something like a ring would, so they’re almost always in perfect condition. A basic stud or hoop design like this never goes out of style and they always look great. 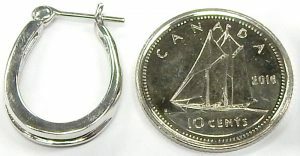 Each white gold earring measures 23.5mm diameter (a little bigger than a Canadian nickel). The earrings contain 4 rows of tiny bead set diamonds each measuring just 1mm diameter. 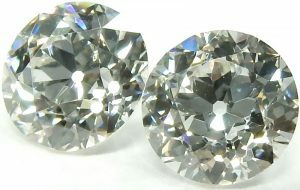 Despite the small size the 184 diamonds are fully faceted round brilliants. It’s hard to imagine but each diamond has 57 individual facets producing a ton of sparkle on the front of each hoop. There are over 10000 flat diamond surfaces that light can potentially reflect off. High quality VS-SI-HI diamonds and high quality construction are obvious. Generous finished weight of 7.5 grams, precise stone setting and the secure tight click of the posts reinforce the high quality look and feel. At only $7.61 per diamond the excellent value is easy to spot. Estate priced at $1400.00. Stock #e9613.